I was set the wee challenge to update a coat that was in need of a little tlc rather than it being placed in the bin. All that was needed was a little sewing to stitch a pocket back in place and replace the buttons as half of them ad fallen off. Apart from this coat is perfect and with these small changes as good as new. 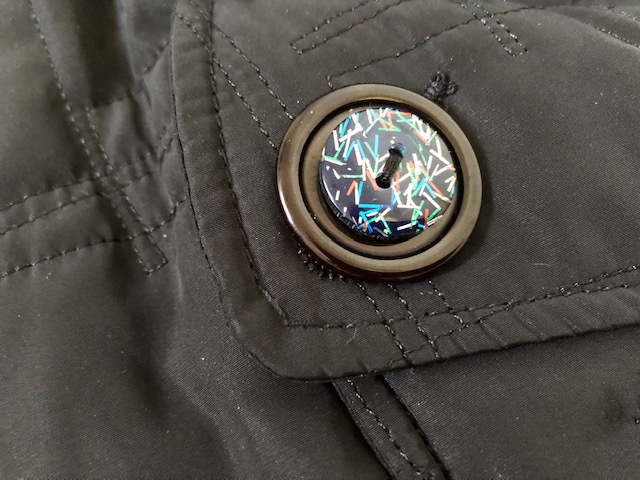 The challenge was to find buttons that the coat owner liked AND were the rightsize, which was 30mm. This is where I came slightly unstuck - to start with! I could find buttons that were right but none of them were big enough. I did think about making my own from resin proxy glue but given I have not used it before it seemed a big thing to do for the first time - when i wasn’t the coats owner! However, did make me think. So I found some plain black buttons that were the right size with holes going through the button. Then I took the buttons that were the correct design and simply glued them on top of each other alining the holes so that when they had died I could sew them to the coat.